Breathing techniques are a proven way to release tension, manage anxiety and restore depleted energy reserves. Learning how to breathe more efficiently can have a profound effect on your mental, emotional and physical health and well-being. 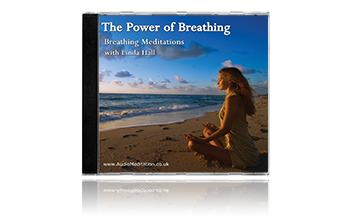 The mindfulness meditation breathing exercises in this collection are combined with positive visualisation and affirmations to help you feel better in yourself and deal with life’s challenges. 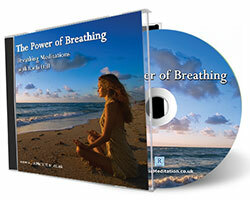 The way you breathe is directly affected by your thoughts and feelings as well as your general health and well-being. Just as you naturally develop thought and behaviour patterns, you also develop patterns of breathing, and it’s likely you’ve established some unhelpful breathing habits. The good news is that old breathing habits can be replaced with new, healthier ones.Mindfulness breathing exercises, combined with positive visualisation and affirmations are a powerful way to establish more relaxed and efficient breathing habits. Meditation itself naturally triggers the relaxation response in the Parasympathetic Nervous System, automatically inducing deeper, slower and more relaxed breathing rhythms. It’s a two-way, accumulative process: the relaxation response calms your breathing, and breathing calmly settles your nervous system.You were born to breathe from your diaphragm, a flat, elastic muscle that sits at the bottom of your lungs, above your digestive organs. It draws the air in and out of your lungs in a bellow-like movement. When you grew up you probably forgot how to breathe deeply and fully from your diaphragm and adopted shallower, less efficient breathing patterns. Breathing in this way makes it more difficult to manage stress, in fact shallow, rapid breathing can actually trigger stress and anxiety attacks.